Microsoft's Windows 10 update request is borderline annoying, and it doesn't even show any concern about crashing in on a live TV broadcast. Those still using Windows 7/8 have already grown used to the nagging Windows 10 update windows popping up at will (or found a way to unofficially get rid of it). 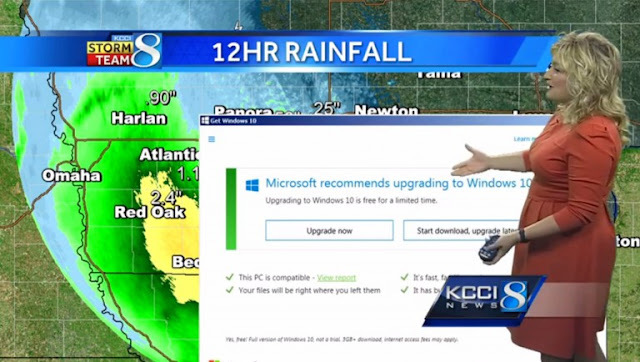 A technique that makes us think that is secretly hoping for users to click on the update button by accident, as they provide no button to simply state "I have no intention to update to Windows 10 and don't want to be bothered again with this!" And nothing shows the need for such an option better, than having the annoying reminders popping up during a live TV weather forecast report. Sure, we can call it funny, and it most likely contributed for this TV channel to have an increases in viewers over the past days; but... won't this also means that the next time this TV station has to choose between two different systems, one using Windows and other using other OS, won't they be more likely to choose the one without intrusive windows popping up?